Fab-Line Machinery provides our customers with an elite selection of metal fabrication machinery. Browse our products below and contact us today to learn more about procuring a machine for your facility or business. High-performance, high accuracy rack and pinion system that is designed for fast, economical, and serviceable operation. Integrated in our Cleveland, Ohio facility. American Made. 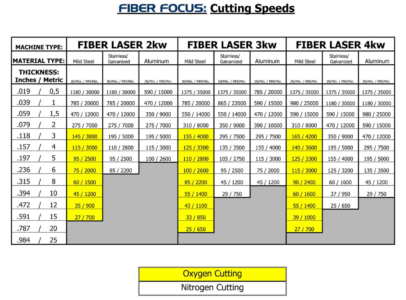 Fast: 200% - 300% Faster than Co2 Lasers, Featureing 2 kw, 4 kw, 6 kw Power Supplies. The APHS Hydraulic Press Brake, the top of the line model of the servo hydraulic press brakes, is a multiple axis press brake providing a 2-D touchscreen graphical control. Press Brake options such as extra height, longer stroke, or even tandem, triplet and quad special designs are also available. Bending tonnage ranges from standard sizes of 44 to 660 ton, and up to 6000 tons. Bending length is 4 feet to 60 feet. The APHS provides you any machine specifications you may need for your job. The APHS Hydraulic Press Brake is the ideal solution for those looking for a multiple axis press brake providing a 2-D touchscreen graphical control. In addition, any changes to the frame for making specials with extra open height, longer stroke, or even tandem, triplet and quad designs are available with the APHS Hydraulic Press Brake. When looking for a multiple axis press brake, graphical control, extra open height, longer stroke and the ultimate in flexibility, contact Fab-Line Machinery to assist with selecting the best press brake for your bending application. The APHS Compact Servo Hydraulic Press Brake is a competitively priced Servo Hydraulic Press Brake. With up to a four-axis capability, plus the ability to have CNC crowning as an option, it is our most popular press brake. The APHS Compact Press Brake standard models can handle 44 tons to 330 tons and lengths from 4 feet to 14 feet. Those looking for a competitively priced Servo Hydraulic Press Brake will find it right here at Fab-Line Machinery. The APHS Compact has up to a four-axis capability plus the ability to have CNC crowning as an option. The APHS Compact Press Brake standard models can handle 44 Tons to 330 Tons and lengths from 4 feet to 14 feet. This Model is loaded with standard features like a 16″ throat depth, 39″ backgauge range, support arms on linear guides and even a starter tooling package, to only mention a few. Almost all manufacturers only offer these as options. The APH Conventional Press Brake is simple hydraulic press brake for applications that do not require the features of a synchronized press brake. Economical, reliable and able to bend from 44 tons to 330 tons and 4 feet to 14 feet, this press brake is exactly what your company and facility needs. The APH Conventional Press Brake is the perfect option for those seeking a very simple hydraulic press brake and do not require the extensive features of a synchronized press brake. The APH Press Brake is a very reliable press brake and should be considered when looking for an economical way to bend your parts. The APH Conventional Hydraulic Press Brake is the ideal press brake for those seeking a simple and competitively priced press brake with heavy-duty construction. Contact us today to discuss which hydraulic press brake is the best for your applications and company. The HNC hydraulic shear is for those who require a full CNC controlled heavy duty shear, with feature rich options which provides shearing performance that no other CNC controlled shear can accomplish. Shearing capacity is 1/4-inch to 1-inch and shearing length is 10 foot to 20 foot, with longer sizes available upon request. The HNC Hydraulic Variable Rake Shear is a heavy duty hydraulic swing beam design shear and for those who want to have a simple heavy duty shear with all of the required features. For a feature rich and competitively priced heavy duty Mechanical Shear, contact Fab-Line Machinery to discuss your cutting applications. The HGL hydraulic swing beam design shear is a very economical shear with all of the features typically required. The pull down design provides the ability to have a low profile hydraulic shear that is easy to operate by any operator. Shearing capacity is 1/4-inch and shearing length is 8, 10, 12 and 13 foot. The HGL hydraulic swing beam design shear is a very economical shear for those who want to have all the desired shear features at a great price. The pull down design provides the ability to have a low profile hydraulic shear that is easy to operate by any operator. Contact us to discuss which shear with hydraulic swing beam design is the best for your applications. The RGS Mechanical Shear is a very reliable direct-drive guillotine shear for applications that require advanced features of a mechanical shear design at an affordable price. The BAYKAL BPL-H Plasma Cutting System has been designed after years of market research and with input from leading design and supplier companies to be the class leader in precision plasma cutting. With our high rigidity machine, heavy duty drives and smart height-sensing systems we can offer the fastest cutting cycles in the market. With our high rigidity machine, heavy duty drives and smart height-sensing systems, we can offer the fastest cutting cycles in the market. The BPL-H has been designed to capitalize on Baykal’s skill in fabrication and machining to be the strongest and stiffest machine in its class. This structure guarantees long term accuracy and minimum vibration for the whole of the machine’s life. Combined with the precision drive components this means that the machine can give higher quality and accuracy or shorter cycle times for a given quality level. Small details like bearing placement have been considered. Many machines have the bearing surfaces on the front of the beam and others on the top. The top mounting system minimizes damage from dross and the front mounted system keeps the bearing close to the plate for apparent stability. The Baykal system ensures the widest possible bearing base to minimize the effects of bearing clearance or machining tolerances, while limiting damage from cutting dust and dross. The structure is all steel to ensure that there are no accuracy variations caused by thermal variances between, for example, an Aluminum gantry and a steel base. The gantry is fabricated from folded sections, designed to give the maximum stiffness to weight ratio. It is not just the nearest size rolled hollow section which are designed for heavier loads and do not achieve the same dynamic qualities of a purpose designed fabrication. At Baykal, we believe in building long life machines with quality components from such companies as Hypertherm for the plasma, Yaskawa for the motors, Gudel for rack and pinions, our aim is to ensure maximum service life and minimum downtime, but most of all, maximum lifetime return on your investment. The mid height rails and concealed longitudinal cable chain minimize the chance of running surfaces and supply cables and hoses being damaged during loading and unloading. The BPL-H plasma’s unequaled construction ensures long-term stability even in rough fabrication shop environments. Unlike many high rail machines, the rails are isolated from the cutting table, which preserves them from shock during loading and unloading and thermal stress while cutting. The double side drives are fitted with AC servos and very high precision (3 arc minute) planetary gearboxes. This ensures that the drive system is equal to or better than the highest precision systems available in the market. The unique floating drive arrangement allows constant pinion/rack mesh without the excessive wear or compliance associated with spring or pneumatically loaded backlash compensation systems. Particular attention has been given to minimizing run out, backlash and compliance in the drive train, which means that we can run with higher gains and higher acceleration without overshoot or vibration. While many drive systems are selected for torque capacity, the Baykal system is designed to minimize total lost motion by having high precision components, very high resolution (better than 1 micron) and highly stiff mechanical components. The heavy-duty structure and isolated table means that the machine can be quite readily adapted to heavier plasmas and/or oxy fuel torches. The machine can have one or more plasmas for light to intermediate plate, oxy fuel torch for heavy plate and plasma inkjet or powder markers for all metals. The structure is also capable of bevel cutting and drilling features. The BPL-H plasma is fitted with much larger drives than many other plasma machines. This means that the acceleration and traverse speeds (20mm/min – 787”/min) are higher than the industry standard. This translates into shorter cycle times and lower cost parts for you. In the unlikely event of a machine problem, extensive diagnostic tools in the control and plasma allow you to identify the fault and shorten service response time by giving a precise status of the machine and its components. In addition to the plasma and optional marking systems, the machine is prepared to accept a dust and fume extraction system (optional) and class leading programming software. Baykal supports these products along with every machine component, directly saving you time and money by sourcing support from different manufacturers. The ArcGlide THC builds on more than 40 years of Hypertherm’s experience in the cutting industry. Designed to deliver optimized performance with minimal operator input, the ArcGlide THC provides superior performance and reliability for plasma applications while reducing the cost of cutting. The indoors fumes and dust suction system is a self-cleaning type, by means of compressed air pulse. The dust air enters the filter chamber, in which the heaviest particles fall to the floor and the lighter ones are retained by the external surfaces of the filter cartridge. The air is cleaned as it passes into the cartridge, is sent to the plenum chamber at the top of the filter, through the extraction unit and out to the atmosphere. An air pulse extraction system is fitted to provide fast, efficient cleaning of the cells. The system generates a pressure front, which runs through the interior of the cell, thus detaching the dust, which falls to the floor of the chamber. The machine is equipped with the ductwork for connection between the dust collector and the downdraft table. The MicroEDGE Pro CNC brings Hypertherm’s latest hardware and Phoenix® software technology to a product that is customizable for a wide variety of applications. Designed for reliability and ease of use, the MicroEDGE Pro improves cut quality, productivity and profitability by delivering Hypertherm’s cutting process expertise directly to your factory. It is as if you have your best operator on every shift. Using the CutPro® Wizard, even new operators can be ready to cut production parts in less than five minutes. Cutting optimization tips, consumable change instructions and Hypertherm plasma, CNC, and THC manuals are available in multiple languages at the touch of a button. Integrated communications with plasma and torch height control systems deliver automated and expert control using installed factory or custom cut charts. Engineered and tested using the same proven design process as the EDGE Pro CNC for superior reliability and consistent operation in harsh cutting environments. Air-cooled with no dust ingress to reduce stress on components. ProNest is the industry’s most advanced nesting software solution and delivers best-in-class performance and reliability. With ProNest you will experience flexible integration with your 2D and 3D CAD systems, material cost savings from efficient and powerful nesting, and repeatable results from machine-specific setups that deliver optimized cut quality, productivity, and operating costs. ProNest is also easy to learn and use, incorporating the power to manage the most demanding programming applications for plasma, laser, oxyfuel, and water jet. ProNest is Power Made Simple! A considerable percentage of the total cycle time is noncutting time (time spent moving from one cut to the next cut – also known as cut-to-cut cycle time). Hypertherm has responded to industry demand for continuous process improvement with Rapid Part technology; a productivity system that delivers up to a 100% increase in productivity through cut-to-cut cycle time reductions achieved without operator intervention. Rapid Part technology means less cut-to-cut cycle time, maximizing the time the torch is cutting metal and minimizing operating cost. A suite of Hypertherm products contribute to the delivery of Rapid Part technology, each of these products are included as standard features on this system. The Baykal plasma utilizes a zoned down draft table. Table is sectionalized and each section, has two doors for suction. Section/zones quality changes according to the capacity of the machine. For example, in BPL-H 2004, there are 3 sections. These specific sections are separated by a wall. During cutting, only the two doors of one section are opened where the cutting is performed and the doors in all other sections are closed for better suction (This is done by the pneumatic pistons and electronically controlled according to the position of the cutter). Therefore, the suction is done where the cutting is performed. There is a grill, which prevents the cut parts to fall to the opening doors. Only very small particles can pass this grill but they go the bottom of the section passing the opening doors. So they cannot reach to the opening doors. High-performance SiCompact Waterjet cutting machine that is designed for easy-to-use operation. Built with high quality commercial components that are perfect for any standard 2D cutting application. Stainless steel tank integrated and 3 axis CNC gantry tech with helicoidal rack and pinion transmissions with self-lubricating system. Precision waterjet cutting machine with 4 axis I.T.C (Intelligent Taper Control) with touch probe and anti-collision components. Independent stainless steel tank and ball screw transmission with self-lubricating system. The I.T.C system ensures accurate tapers and wall straightness while providing high-fast cutting speeds This is possible due to the CNC inclination of up to 2° and orientation of the high-powered water jet. High quality cuts at a low cost! During I.T.C compensation, the jet is directed towards the piece to reduce the tail delay effect and the acceleration and deceleration ramp times in the corners. This supports a faster and more cost-effective cutting styles. The WaterCad-Cam enables the I.T.C system in a few simple clicks! Do you have questions about our available products? We invite you to call us at 1.866.466.8298 or fill out our contact form. We look forward to finding the perfect Fab-Line Machinery product for your application.